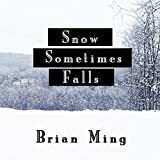 Brian Ming started writing songs and poems at age sixteen. His love for writing music led to authoring fiction, often times coupling songs with story telling. His first novel and public debut, Snow Sometimes Falls, received rave reviews and quickly became an Amazon Bestseller. He is also the author of several short stories, the Future Kingdom Series, as well as a series on Christian living: the Secret Heart Series. Brian is a sought after speaker whose passion to teach others how to develop their God-given creativity to the fullest has inspired millions. He currently resides with his wife Kristen and their three children in Fontana, California.